As wildfire season intensifies due to climate change, a new study finds that the number of U.S. deaths linked to the chronic inhalation of wildfire smoke could double by the end of the century — to more than 40,000 deaths per year. The study, published in the journal GeoHealth, is the first to simulate the effects of wildfire smoke on human health over the coming decades. Researchers looked at the impacts of changing fire emissions on air quality and premature deaths in the middle to late 21st century. Based on the model, the number of deaths from chronic inhalation of wildfire smoke could increase to more than 40,000 per year by the end of the 21st century, up from around 15,000 per year today. Declines in air pollution from human sources such as cars could be offset by increases in emissions from more intense wildfires, according to co-author Jeff Pierce, associate professor of atmospheric science at Colorado State University. In 2017, the U.S. Forest Service’s wildfire suppression costs reached a record high of $2.4 billion. “Smoke concentrations will roughly double and this will counteract a lot of improvements gained from a reduction in emissions from human sources, such as power plants," says Pierce. Wildfire smoke poses a risk to human health because of its composition, a mixture of gases and microscopic particles from burned material known as particulate matter. It can also lead to premature death in people with heart or lung disease, according to the Environmental Protection Agency. For the study, researchers used simulated concentrations of particulate matter generated by a model for early, mid, and late-century time frames. Based on those concentrations, researchers then calculated the expected number of annual deaths due to chronic exposure to wildfire smoke. “We relied on previously done epidemiological studies that have come up with relationships between particulate matter concentrations and death rates,” says Pierce. The findings underscore the importance of preparing for future air quality changes caused by wildfires, according to Pierce. But he cautions that more research needs to be done since the findings were based on a single simulation due to the high costs associated with doing environmental-based computational work. “This is the first simulation of its kind and we don’t have a proper probability distribution model," says Pierce. "With more models, you can come up with a range of probabilities of what the future might look like." The model used in the study bases its estimates on current climate projections that corrects for future things like temperature and relative humidity. “Our study is a starting point and the information could be used as a first estimate of what to prepare for," says Pierce. 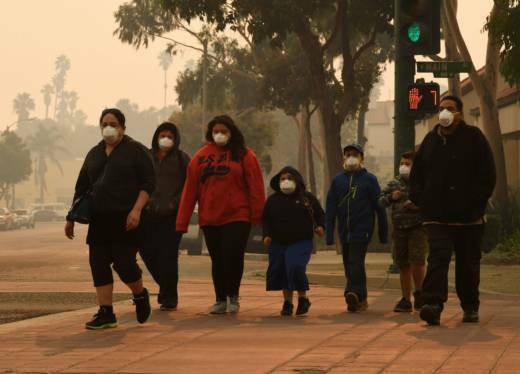 Public health campaigns in conjunction with climate mitigation efforts could help reduce human exposure to wildfire smoke, according to the study's authors.